MSCRM 2011 is an extremely flexible application, so much so that it can easily be used as a development platform to build applications that have nothing to do with Customer Relationship Management. The fact you can build custom entities that are automatically integrated with the security model, reporting framework or workflow runtime should come as a surprise to no one. Because of its flexibility though, I frequently find ways to do things I never would have thought of doing when looking at MSCRM 2011 from an application developer point of view. I want to use this post to introduce a concept which will serve as the foundation for a few really cool tricks I’ve learned recently. So we all know that you can use Custom Entities to model your business entities (and that includes creating them as Activities if need be). However you can also use Custom Entities to store configuration information that’s consumed by other applications. Why would you want to do this? Since MSCRM 2011 is its own application, you have very limited access to what you can modify in the web.config file. For all intents and purposes, whether you’re writing a MSCRM Plugin, MSCRM Workflow, ASP.NET application or other, web.config is off limits. Plugins have a mechanism to include configuration information, but this is limited to MSCRM 2011 Plugins and each section is confined to the specific MSCRM plugin or workflow its registered to. By storing this information in a Custom Entity, you can use MSCRM’s built in Security Model to control access so only the intended parties can see or edit them. With those in place we’ll move on to the real functionality. I’m creating a method with a return type of String named GetConfigurationValue. The idea is that there’s a base method that accepts a single parameter, the name of the Key Field who’s attribute you want returned. 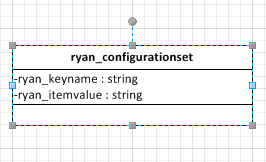 This method just uses hard coded entity and attribute names [for ryan_configurationset, ryan_keyname and ryan_itemvalue). So as you can guess, the other method accepts a key name, an entity name, key schema name and the item schema name. The values you'll use for these should be self-evident. So if you opt for just one configuration entity, you'd use the first overload, if you want to use multiple ones, you'd use the second one. The code to facilitate everything is shown below. I'll post it first and walk through it and explain it afterward. Define a new ColumnSet specifying the name of the Value field to be returned. (You can optionally use the overloaded constructor for the ColumnSet passing true into the constructor. This will however return all fields [the equivalent of using SELECT * in SQL] from the Entity. Because MSCRM adds several fields to every custom entity for internal use, it's inefficient to use this approach. Since the Entity only contains two custom Attributes, it's easy to mistakenly assume that the overloaded ColumnSet approach is easier than specifying all of the required columns , but if you actually try it, you'll see that there are actually quite a few Attributes that will be returned, all of which contain data that is of no value to this particular method). Check the EntityCollection container and make sure that it is not null, then verify that the Count property of the Entities collection is greater than 0. Because this is a RetrieveMultiple method, it's possible that more than one item is returned. Since the method only returns a scalar value this would present a problem of determining which value you should use. If you define the Entity name correctly however, and don't reuse Key names in the Entity (which would make very little sense and would fail validation if you were using a web.config or app.config file), you'll only get one record back if there's a match, or 0 if there is no matching key. Once you've verified that there's at least one Entity in the Entities collection, reference the first item of the collection and the corresponding attribute name. /// Queries a configuration entity to find a match for a given key field.